Riding down the switchbacks toward Truckee. 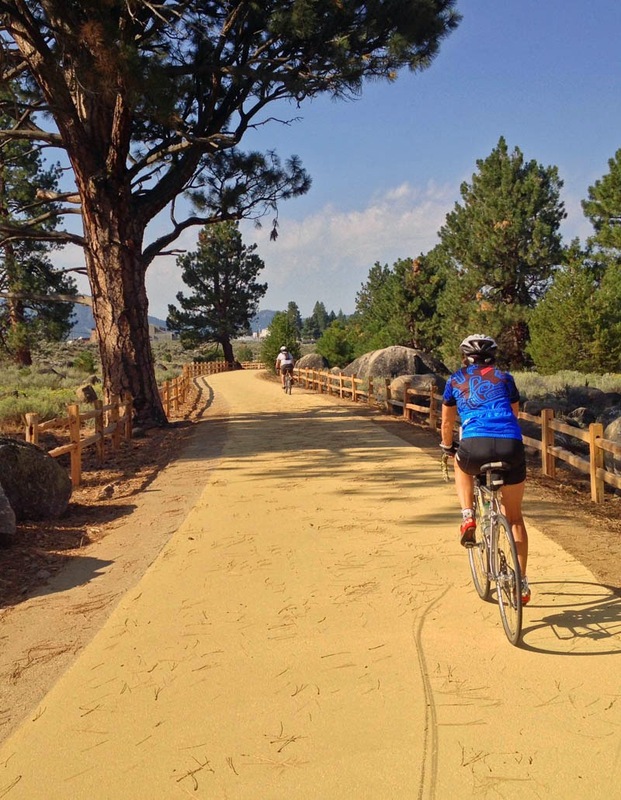 The Town of Truckee has just completed a 3 mile trail extension to the Truckee River Legacy Trail. The trail is now 5 miles in length and connects Truckee Regional Park with Glenshire housing development. 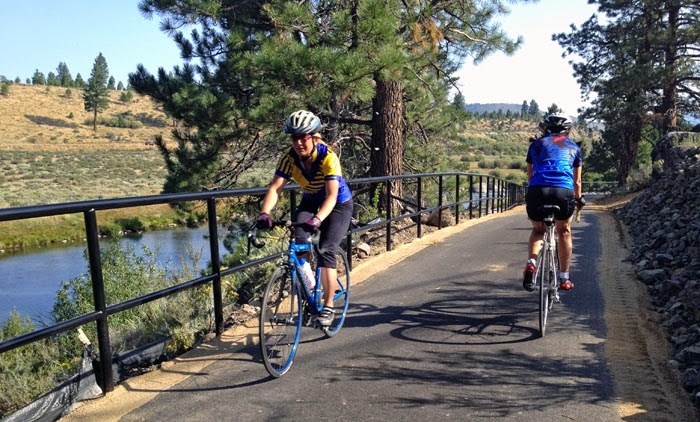 The paved trail provides users with beautiful river views as it winds along the Truckee River. Some of the pavement is a unique tan color. There is a split-rail fence lining both sides of the trail as it passes through an open meadow that leads to a bridge. The bridge spans 150 feet across Martis Creek. After the bridge, the trail goes into a series of switchbacks that travel up a hill to Glenshire. The views toward Northstar, the Truckee River, and Truckee are spectacular from the top of the hill. There are several benches along the way where you can pause and enjoy the scenery. Many of the benches have historical interest boards. 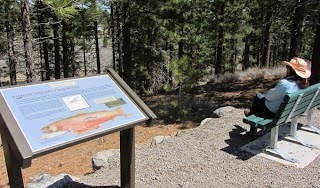 The interest boards reference the first Truckee inhabitants, ice harvesting, and other Truckee history. 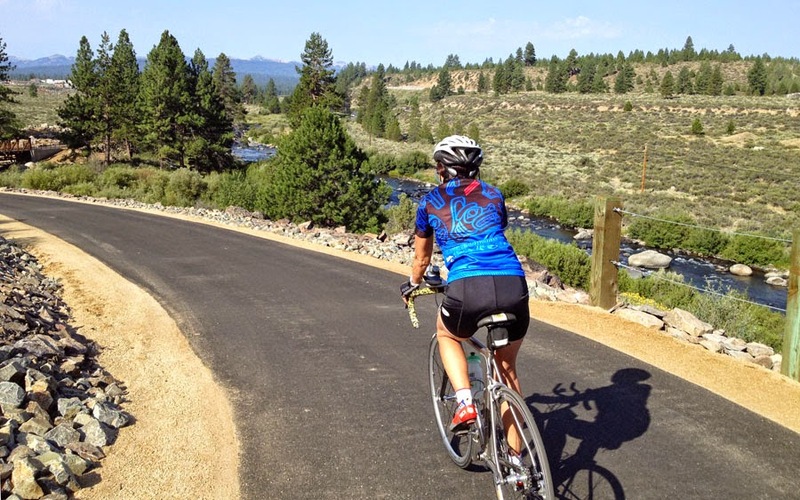 The Truckee River Trail showcases the beauty of the Sierra with a first class family friendly trail for year round use. The trail isn't plowed in the winter, so cross country skiing and snowshoeing is popular in winter. The Town of Truckee has long-term plans to continue the trail west out to Donner Lake. The recently passed Truckee Trails sales tax increase should provide the funding for continued growth. There is access and parking at four locations along the trail. Glenshire Drive near Light Hill Place.